There was overwhelming rice wreath support for Ryeowook’s musical debut. When the musical Temptation of Wolves started its run on July 14, some Ryeowook fans already sent congratulatory rice wreaths. But a lot more poured in for his first performance on August 10. The rice wreaths were sent by fans from 10 countries and territories — Korea, Japan, China, Taiwan, Hong Kong, Thailand, Malaysia, Singapore, Vietnam, and New Zealand. 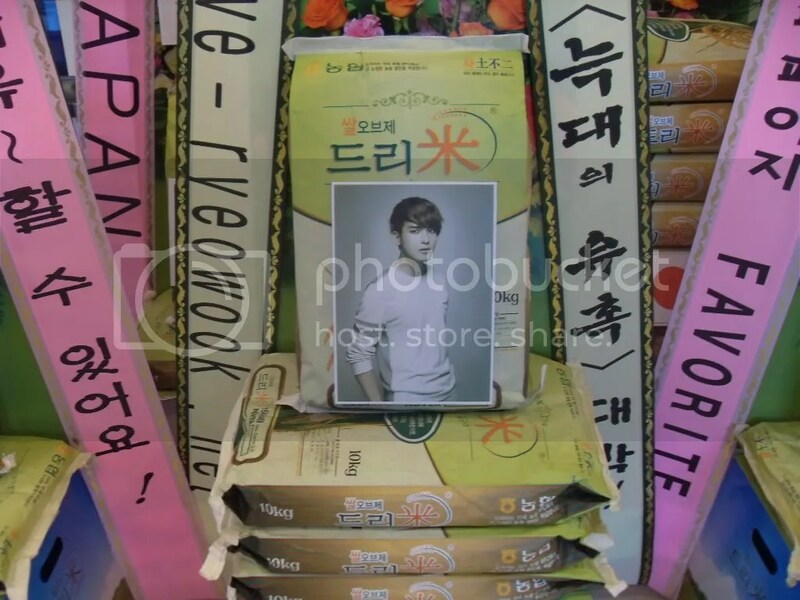 The rice collected in Ryeowook’s name came up to 2.48 tons. The total for all the actors in the musical came up to 3.54 tons. The rice wreaths for the press conference on June 15 was 1.02 tons. So the grand total for the musical stands at 4.56 tons. The rice will be donated to the needy in the idol’s name. 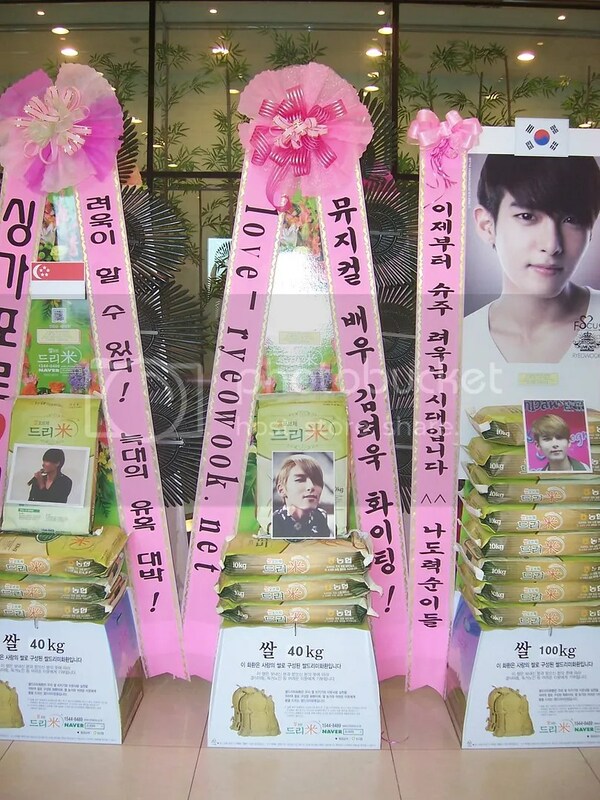 Just as we had done for the press conference, love-ryeowook.net showed our support by sending 40kg of rice. On June 9, 2011, we posted a notice to raise funds for our food support project for Ryeowook’s musical. 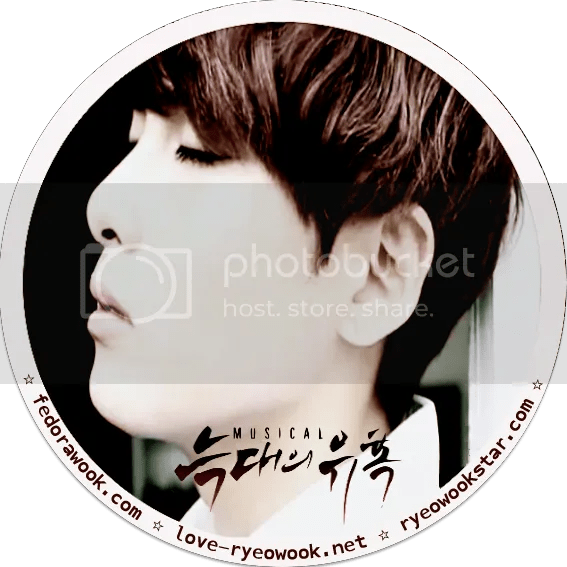 We’re pleased to announce (if you didn’t already know) that the joint food support with FedoraWook and RyeowookStar was carried out successfully on July 12 during Ryeowook’s musical rehearsal. Ryeowook tweeted about it (sadly, he did not specifically name us) but we’re happy to report that he did sign a poster for all three sites involved in the joint project. But more on that later. First, this is the sticker that was made for the food support. 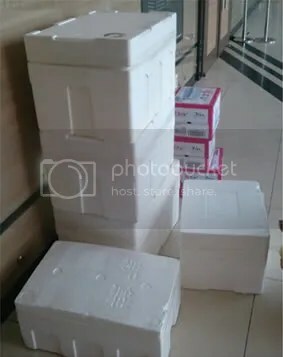 The boxes of food that were delivered by our partner site FedoraWook to the rehearsal venue on July 12, 2011. SJ-M attended MTV EXIT Concert in Chiang Mai and one of our admin had a chance to go there. We together with Ryeowookstar.com prepared some gifts for Ryeowook. 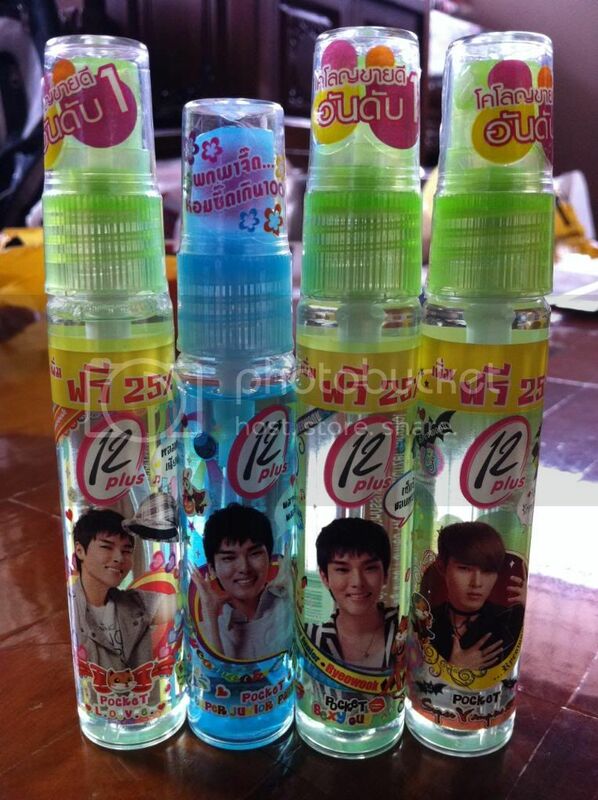 We gave every versions of 12Plus Cologne that have him as presenter on the bottles. It’s now common for fans to send congratulatory rice wreaths (쌀화환) to celebrate their idols’ events such as press conferences or fan meetings. 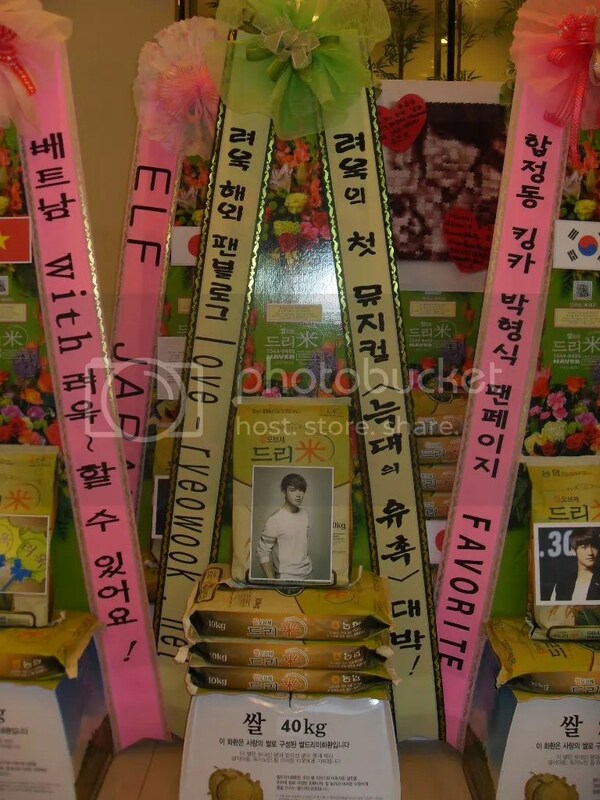 The rice is donated to charity so fans can support their idols as well as contribute to a good cause. 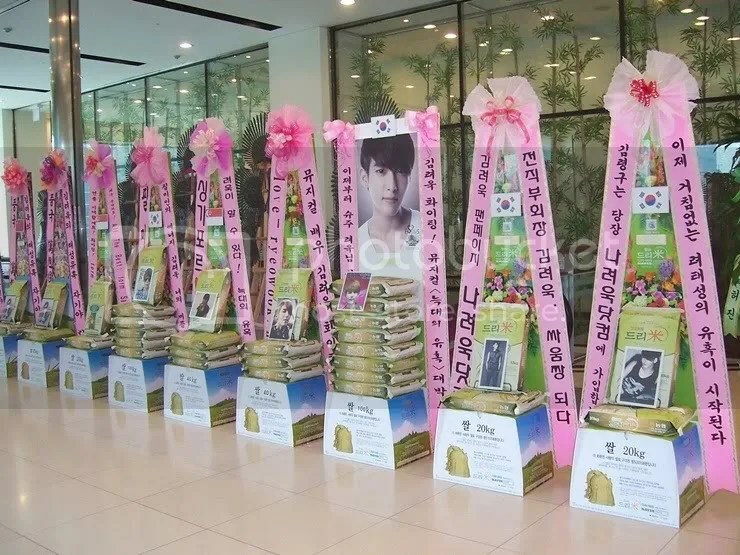 At the press conference of his musical Temptation of Wolves, Ryeowook’s fans from various places, including Korea, China, Taiwan, Malaysia and Singapore, sent Ryeowook rice wreaths totalling a ton. A collage of all the rice wreaths at the press conference venue.